Many baby boomers dream of retiring somewhere by the water. These half-dozen places are on a lake, a river or an ocean - yet they won't sink your retirement budget. The nation's best beach is a short sail from here.  What's your dream retirement? Pros: Less crowded and less expensive than many towns on the Atlantic side of the state. 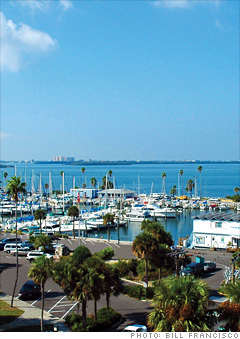 Just a few miles north of Clearwater and 20 miles west of Tampa, Dunedin (pronounced dun-eed-in) was settled by Scotsmen in the late 19th century. Morning rush hour is a steady flow of walkers, joggers and bikers cruising the 37-mile Pinellas Trail or heading over the causeway to Honeymoon Island State Park, a 385-acre recreation area with four miles of beach and more than two miles of nature trail. Many stay on the island to snorkel, kayak and swim. Others hop the public ferry to Caladesi Island State Park - the best beach in America, according to Florida International University's Laboratory for Coastal Research. "The sand is so white it looks like sugar," says the lab's director, Stephen Leatherman. The city pays homage to its Celtic heritage at the Dunedin Highland Games, an annual celebration of Scottish music, dance and sports. And if that makes you feel as if you've stepped back in time, wait till you see the home prices. Three-bedroom houses go for around $200,000, says Nikki Ubaldini, a broker with Keller Williams Realty; condos near the water range from $100,000 to $200,000.